Japan’s 11 March Tohoku Earthquake is among the strongest ever recorded, and because it struck one of the world’s most heavily instrumented seismic zones, this natural disaster is providing scientists with a treasure trove of data on rare magnitude 9 earthquakes. Among the new information is what is believed to be the first study of how a shock this powerful affects the rock and soil beneath the surface. Analyzing data from multiple measurement stations, scientists at the Georgia Institute of Technology found that the quake weakened subsurface materials by as much as 70 percent. That nonlinear response from the top layer of the Earth’s crust affected how the movement of faults deep beneath the surface was delivered to buildings, bridges and other structures. Understanding how the soil responds to powerful earthquakes could be important to engineers and architects designing future buildings to withstand the level of acceleration measured in this quake. The information will also help seismologists develop new models to predict the effects of these rare and extremely powerful events. A Georgia Tech release reports that the findings were reported in a special issue of the journal Earth, Planets and Space (EPS). 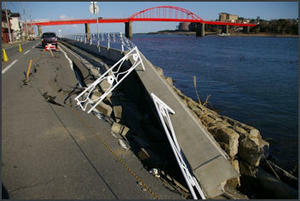 The research was sponsored the National Science Foundation (NSF) and by the Southern California Earthquake Center (SCEC). Peng and graduate student Chunquan Wu were among the first scientists to examine data recorded by the high-quality seismometers that are part of the Japanese Strong Motion Network KIK-Net. The stations have accelerometers both on the surface and in boreholes located on bedrock far beneath it. The researchers chose to study data from six stations that have strong velocity contrasts between the surface soil layers and the underlying bedrock.